Do you want to star in All For One? Then simply fill in our casting form! This ensures you are on the list of potential cast members for the production. Should it be oversubscribed, roles will be allocated by lottery. Casting is now closed. We aim to let everyone know if they’ve got a role before the end of June 2018. 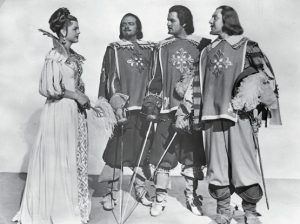 Roles available are characters with the rank of Cadet-in-training to the King’s Musketeers, or their servants. Cadets-in-training will play the game out in groups of six. They may be of any gender. They may come from various backgrounds. They may have been officers or private soldiers in other regiments. They may be nobility or commoner. All will have a reason to have made Cadet: reputation, connections, or service of some sort. During the game, Cadets will go on missions for the King and others, take part in military action, swash, buckle, carouse, dance, attend a ball, a feast, and generally roust about. Each group of six cadets will be need to be accompanied by a servant. During the event, servants will support their cadets, and take advantage of their social invisibility to deal in Secrets. If you wish to be assigned to the same group as a fellow actor, please specify it on your casting form. Once we know our cast, we’ll work with them on their characters. This will start with each cast member picking from the list of tags to indicate how their character fits into the events of All For One. They might be Noble, or Vain, or Religious, or Proud Of Their Region, or any number of others. We’ll suggest an initial set, and invite cast to add more. Every character will have a Regret, an Ambition, and a Secret to come out in play. By the time we’re finished collaborating on characters, they’ll each have a Nemesis too. Every star will spend a small proportion of the larp playing a supporting role. This enables us to have the ‘cast of thousands’ that everyone’s starring moment deserves. There will be additional supporting cast roles, but we’re not currently putting out a general call. Larpx is where Harry Harrold thinks out in the open about stories and games and larp, and a place for things other people have written to live. Purveyors of ridiculously high-concept effects-heavy live-action events, mixing up LARP, theatre, film and computer games.